For many people, training for and being awarded a Private Pilot’s Licence (PPL) is one of the most satisfying achievements they have experienced. This is not only because as a Private Pilot ones leisure and/or business horizons are literally expanded but, because like all things worth striving for, it is necessary to overcome some difficulties and obstacles, and learn new skills before the goal is ultimately reached. The EASA sets high standards for both flight and ground school training and many people embarking on a PPL course underestimate the commitment required to gain the licence. Quite often, the single largest problem is finding the time necessary to complete both flying and ground school training with some degree of continuity. You may have also discovered already that flying instructors themselves often have limited time to devote to the ground subjects – particularly when the weather is fine. The Home Study Courses offered by Moorgoods Aviation Studies enable the student pilot to complete the ground training at his or her own pace when time is available and in the comfort of home. Our Home Study Course will save you a great deal of time and effort in working towards your PPL, since it is geared specifically to the areas of questioning that the EASA presently favour, and is a “Structured Learning Process”. We emphasise that Home Study Courses are complete, that is to say, no further books or study material is necessary for the subjects listed. We could also keep you posted on any changes in Aeronautical Information Circulars (AICs), which effect EASA examinations. The course is very comprehensive and in most years have a 100% pass rate for students taking the examination at the first attempt. The PPL qualification is most rewarding, and now is the time to make that investment in a properly approved course, and start studies in readiness for flying training. Moorgoods Aviation Studies was originally formed as Cranfield Aviation Studies by Roy Quantick and associates in recognition of the shortcomings of many flying schools to meet the ground training requirements. Roy Quantick has many years experience in preparing, marking and assessing progress in all subjects required for PPL and the Professional Pilot Licences. Moorgoods Aviation Studies is run by Kevin Foster who is the MD and ex-fixed wing pilot and current helicopter Flying Instructor and commercial pilot for Moorgoods Helicopters Ltd. Another plus for learning with Moorgoods Helicopters Ltd is that Kevin Foster is also an examiner for the written Ground Study Examinations. Roy Quantick has written a number of aviation textbooks which have become “Standard References” throughout the world, and have been translated to date into 4 languages. All the writers are experienced pilots and/or navigators who were trained in the RAF and became subsequently Senior Captains and Navigators in the airlines. Furthermore, the writers are also former full-time lecturers at CAA approved training establishments, and are all ‘approved’ by the CAA. Moorgoods Aviation Studies therefore has the expertise to guide you successfully through all the ground subjects. The Home Study Courses offered by Moorgoods Aviation Studies are complete, that is to say, no further books or study material is required to pass the EASA examinations. The courses adopt a structured learning approach, which you may follow at your own pace. The approach adopted in preparing for the PPL licence examinations is to divide up each subject into two sections, which lead to a short series of Progress Test questions requiring the student to answer. These are all multi-choice format. All subject material, questions and answers including Final Practice Papers can be supplied on CD ROM’s. The course concludes with sample EASA style examination papers, in multi-choice format. The courses are geared to the EASA examinations, and provided the student completes the course and has shown progress there should be no problems in passing the ground subjects. Furthermore, once the student has passed the examinations and the licence is issued, the material acquired over the duration of the course will continue to be a valuable reference aid to future flying activities. It will serve as a base for upgrading to professional licences if the student should decide on a flying career. As you are contemplating obtaining a Private Pilots Licence, a few items for your consideration, which has come to light over the many years of administrating the Home Study Courses. (In these notes, students mean HE or SHE). In the main, students underestimate the scope of the ground subjects. A total of nine subjects in all, the time limit to pass all ground subjects and the flight tests (Skill Test and Cross Country Flight Test) is 18 months. This may sound like a long time, but the study programme and the flying training must be planned in order not to waste money, or run out of time. As an example (and this is not an isolated case); when a student decides, to become a private pilot, and has never been aloft in a light aircraft, it is strongly recommended to obtain a trial lesson. This is offered by most flying training organisations, and is usually cost effective, as the organisation would wish to take the student on a full training course. The trial lesson can count towards a properly structured flying course, dependant on timing. It is not surprising at this stage, that a good deal of enthusiasm and keenness to fly overrides some of the details. The flying organisation will press the student to start as soon as possible. The student, however, must not loose sight of the ground studies that must be done. If the enthusiasm carries the student along without due attention to ground studies, the next thing that happens is that the instructor (who has done a great job getting the student up the point where a solo flight is getting close) cannot authorise such a flight because the student has not sat the EASA examination in Aviation Law, Flight Rules and Procedures. The next step is a panic scramble to study the Air Law etc., and sit the examination. This costs time, not only for the studies, but also in this country with such changeable weather, further delays are not uncommon. The net result is that when the student gets back to flying, extra flying has to be done to recap, and get back to the stage he had already reached, days weeks or even months earlier. The important psychological step of having performed a solo flight has been lost, and enthusiasm may suffer as a consequence. The extra flying is extra expense, not that the flying organisation is going to complain as they earn their keep by flying aeroplanes. Most flying training organisations do not cater for the ground studies. A quick and hurried lecture because the weather deteriorated is not the way to learn the academic material as its hit and miss. What is required is a STRUCTURED LEARNING PROGRAMME. At the same time, a close liaison with the flying instructor is vital as the flying instructor is the key person in the training. The timing of examinations is dictated by flying progress, and only the flying instructor can assess this. This highlights the importance of the relationship between the student and the flying instructor. The student must feel he is progressing and able to acquire the physical skills in controlling the aeroplane. In the early stages, aspects of Air Law will be explained by the flying instructor, and the JAA expects the student to pass the Air Law examination before he takes a valuable aeroplane some thousand feet or so into the air for the first time in the neighbourhood of other aircraft. The instructor would indicate (based on the students progress) that he is not far away for a first solo flight, it is then advisable to sit the EASA examination in Air Law. This means that NO DELAY will be experienced in taking this very important and psychological step in the training programme. However, the student has eighteen months from that examination date to complete the remainder of the ground examinations. The main problem in the UK with flying training is the weather. Sometimes weeks can go by without suitable weather for initial flying training. Then there can be weeks of good weather, and a lot of flying training may accumulate. Assuming the student has performed a solo flight, the training progresses towards cross country flying, and here again, the EASA expect the student to have passed Air Navigation, Meteorology and Human Performance and Limitations before a solo cross country flight. Students can if they wish, complete all ground studies and examinations before undertaking flying training. Many students who go to the USA for flying training often opt for this course of action. An applicant shall be deemed to have successfully completed the theoretical examinations for the EASA-FCL PPL when awarded a pass in all the examinations within a period of 18 months. A pass will be accepted for the grant of A EASA-FCL PPL(H) during the 24 months from the date of successfully completing the theoretical knowledge examinations. It is best that Ground Studies should run parallel with the flying training in order to optimise the examination sittings. At MOORGOODS AVIATION STUDIES we strongly advise students to start ground studies as soon as the decision is taken to learn to fly. Certainly after a trial lesson consolidates this decision. Some of the study material supplied in the early days may seem somewhat academic, but things start to make sense when the flying instructor points out or demonstrates the various items. The importance of early studies has been seen to help the student understand those items and this is not only more efficient, but by definition, cost effective. Successful flying training relies on continuity and no delays should be experienced in training because ground examinations were not done in time. A further area that should be mentioned is the recommended reading. There are many excellent books available by eminent and experienced authors. Authors have a primary objective ie., to sell as many books as possible, therefore they are usually filled with a vast expanse of material to make a comprehensive manual on a particular subject. In the early days of studies, these books can be bewildering, and students need guidance towards those areas necessary to meet examination standards. If a student has not actually purchased any books, then DO NOT. Study the Moorgoods Aviation Studies structured learning guide to meet these standards. After some experience, books may be considered as reference material and indeed, certain classical flying manuals should be on the shelf for later reference. MOORGOODS AVIATION STUDIES is the only organisation which has specialised in structuring a PPL home study programme, which can be pursued at a rate which suits the student and his flying training progress. The whole syllabus is comprehensively covered in the Moorgoods Aviation Studies student notes. The objective is to bring the student up to the examination standard in each subject and not burden him with extraneous material, which is not necessary in the early days of training. A further point to consider. A flying training organisation may offer a competitive rate for training, particularly if money is requested up front. In the first instance, shop around if you have a choice in your area. Some organisation offer free examinations, you may be obliged to join the flying club. It is advised to try an hour or two of regular flying training. This will establish your aptitude to the new environment, and also to see how you get on with the instructor. After all, the flying instructor is someone you MUST get on with, and you are going to spend a lot of money. Assuming all is well, then a deal could set up for the remainder of the flying training if it is offered. We do not wish to make this exercise sound as if it’s full of pitfalls, because if you are keen to learn to fly then you will do it. In the main, flying clubs are run by enthusiasts, and to meet other students like you, can be stimulating and enjoyable during the training phase. The academic subjects are not difficult, but some of the material may be quite new, but most likely interesting, like Human Performance and Limitations, which is not unique to aviation but can be seen to have relevance in other areas of life. The modern light aeroplane is a joy to fly, and providing the student pilot is trained properly, is also safe. Bare in mind those points mentioned about shopping around and paying for training. Our study course represents only about five percent of the total training costs for fixed-wing aeroplanes (two percent for rotary-wing aeroplanes). We consider that our successful students have had the proper grounding for a safe future in what ever area they choose to pursue in aviation having made the investment in a properly structured and approved course. These notes have been prepared as a result of enquiries and feedback from students. It is hoped that they are useful to prospective students in planning to obtain a PRIVATE PILOTS LICENCE. You will need to purchase a CRP1 Navigation Computer, a Scale Ruler, Protractor, a pair of dividers/compass in order to complete the navigational part of the course. Details of these items are shown below. The CRP-1 is designed particularly for the Student and Private Pilot. Easy to handle, it includes all the necessary functions for examination, planning and flying requirements. This model is widely used by flying training organisations in the United Kingdom and throughout the World. 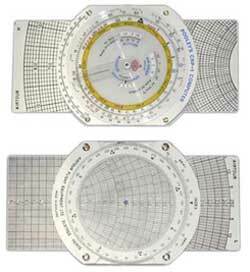 Circular Slide Rule side with clear durable cursor. For calculation and conversion of Temperature, Time, Distance, Volume, Altitude and Density Altitude, Speed, Weight, Fuel, Endurance, Multiplication and Division, 1 in 60 rule etc. Coloured scales and lettering enhance operation and clarity. Wind Triangle side incorporating sliding scale with speed range of 40-850 and clear rotating disc for lead pencil plotting. Use it for calculation of Heading and Ground speed, Wind Velocity, head and Crosswind Components etc. Standard Flying School issue. Outside edges respectively read 110 nautical miles in 1:500 000 and 55 nautical miles in 1:250 000. Centre scale converts between kilometres and nautical miles. Standard Flying School issue. 128 mm square. 0 – 360 degree scale on outside edge with reciprocal headings indicated adjacent. Location letters NE, SE, SW., and NW on corners. Centre drilled for location and gridded squares of 13 mm (4 nm) supplied in self-sealing plastic slip case. Students who intend to go on towards the CPL and ATPL studies should consider purchasing the CRP-5 computer instead of the CRP-1. The professional examinations require computations involving compressibility corrections etc.